The ultimate in luxury resides in The Penthouse Suites, from the 59th to the 63rd floor and our Skyloft Penthouses on the 64th & 65th floor. Here, the perfect marriage of architecture and interior design creates one-of-a-kind residences that offer panoramic and unobstructed views, sleek gourmet kitchens, gorgeous ensuites, generous wrap around balconies and superior finishes throughout. For a limited time the builder is offering $10,000 off any Penthouse or Skyloft, a Canderel Digital Home System (valued at $8,000), a Samsung Galaxy tablet, and an impressive list of luxurious Penthouse features and premium finishes (with an approximate value of $120,000). Penthouse suites are $969,000 to $1.4 million. 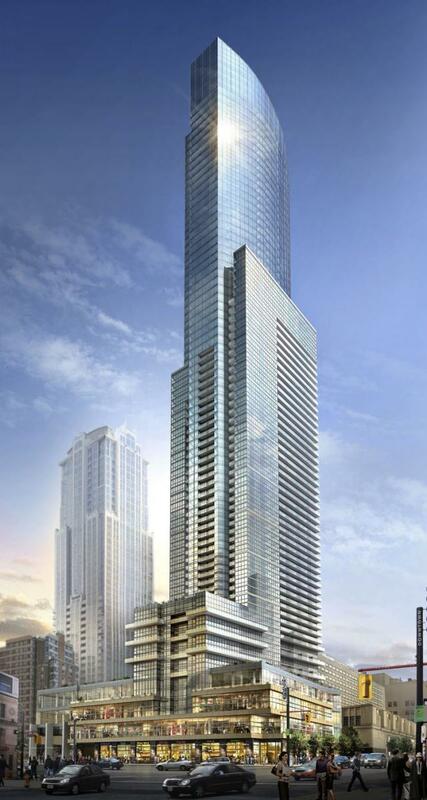 Skyloft penthouses are $849,900 to $1,379,000. Above the city and just below the clouds, the penthouse floors (76 to 79) of Canada's tallest condominium are the most prestigious residences in Toronto. These suites have superior finishes, floor to ceiling (10') windows, unrivaled views, and access controlled elevators. For a limited time the builder is offering up to $60,000 off the purchase price off the penthouse suites, with the ultimate in designer features and finishes (up to $210,000). Move in spring 2015.